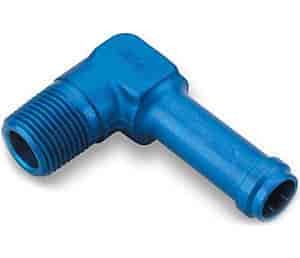 Earl's Male NPT to Hose Barb Fittings are precision machined from aluminum and anodized blue for durability and great looks. These fittings are available in a variety of sizes and angles to accommodate a wide variety of custom plumbing situations. ! Note: NPT Fittings seal on threads and it is recommended to use PTFE tape or Sealing compound during assembly. 984208 is rated 5.0 out of 5 by 1. Rated 5 out of 5 by BrianK from Moves the Fuel Just installed and it worked way better than rigging the wrong size elbow. Well made, fit perfect and has a good coating that stands out with braided hose.